The Muslim Student Association (MSA) would like to invite you to the Islam Awareness Dinner on April 12th at the Madren Center Auditorium. Guests will enjoy a traditional halal buffet dinner, dialogue, Q & A, and so much more as our speakers talk about multiple topics that affect the minority Muslim population here in the United States. 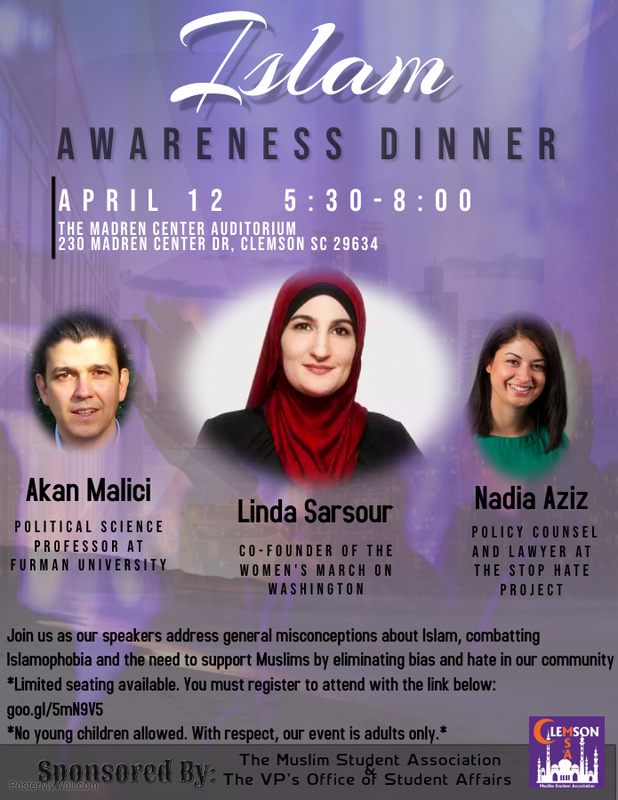 Our amazing panel of speakers include political activist and co-founder of The Women’s March on Washington, Linda Sarsour, local Furman Professor and author, Dr. Akan Malici, and Clemson Alumni and lawyer for the Stop Hate Project, Nadia Aziz. Our speakers will address general misconceptions about Islam, the prevalence of hate in our community, how to combat Islamophobia, and much more! You must sign up if you would like to attend. Limited seating is available. Adults only. Donations are welcome to offset the cost of this event and future events.